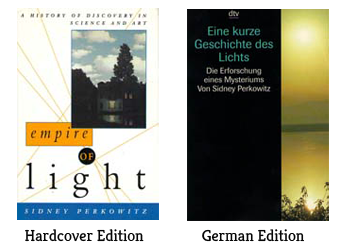 In Empire of Light, Sidney Perkowitz combines the expertise of a physicist with the vision of an art connoisseur and the skill of an accomplished writer to offer a unique view of the most fundamental feature of the universe: light. 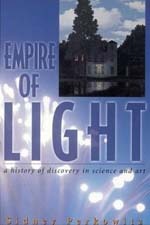 Empire of Light discusses the nature of light, how the eye sees, and how our understanding of these phenomena have emerged over the ages, including the role of light in the development of quantum physics. The author examines the making of electrical light and its integration into commerce, telecommunications, entertainment, medicine, warfare, and every other aspect of our daily lives. And he presents the role of light in the search for the beginning and the end of the universe, as astronomers with their instruments penetrate ever deeper into the sky. Visible light spans the spectrum between infrared and ultraviolet, but this book reaches across many other spectra as well–from the cave paintings at Lascaux to Mark Rothko’s stark blocks of color in today’s art museums, from Plato’s speculation that the eye sends out rays to Ramon y Cajal’s discovery that vision actually works in the opposite way, from Tycho Brahe’s elegant antetelescope measurements of planet positions to the Hubble telescope’s exquisite sensitivity to light from billions of light years away. What are the biological and neurological processes of perceiving visible light? How does a person typically scan a scene? Do you see red or blue the same way I do? What are our physiological reactions and emotional responses to light? Perkowitz explores these and many other fascinating questions, drawing together the experiences, achievements, and perspectives of a diverse cast of characters, including Galileo, Einstein, Newton, Van Gogh, and Edison. Empire of Light is written so that lay readers will readily grasp the scientific principles and science professionals will readily appreciate the human experience. It will impart new wonder to the daily experience of light in our world. Order your copy of Empire of Light from Amazon.com today.